Who is ahead in this 2019 NBA Playoffs edition of the rankings? NBA.com's Sekou Smith has his latest MVP ladder for your review. Check out the best moments from Thursday's Playoff action. Kevin Durant speaks after erupting for 38 points on 14-23 shooting to lead the Warriors over the Clippers in Game 3. Kevin Durant says the Clippers are running a gimmick defense that is working against him and the Warriors' offense. • Selected by the Seattle SuperSonics in the first round (second overall) of the 2007 NBA Draft. • Signed as a free agent with Golden State on July 7, 2016... Re-signed with the Warriors on July 25, 2017. • Won an NBA Championship with Golden State in 2017. • Named NBA Finals MVP in 2017 with averages of 35.2 points, 8.4 rebounds, 5.4 assists, 1.60 blocks and 1.00 steals in 39.8 minutes per game in The Finals... Became the second player in league history to win the Finals MVP Award while averaging at least 35 points, eight rebounds and five assists in The Finals (Michael Jordan in 1993). • Named an NBA All-Star eight consecutive times (2010 through 2017), starting six times. • Named to the All-NBA Team seven times... Earned All-NBA First Team honors for five-straight seasons (2009-10 through 2013-14)... Earned All-NBA Second Team honors in 2015-16 and 2016-17. • Four-time scoring champion (2009-10 through 2011-12, 2013-2014). • Named NBA Most Valuable Player in 2013-14, scoring a career-best and NBA-high 32.0 points and dishing out a career-high 5.5 assists to go with 7.4 rebounds and 1.27 steals in 38.5 minutes, shooting 50.3 percent from the field. • One of seven players in NBA history to hit 50 percent from the field, 40 percent from three and 90 percent from the free throw line (while qualifying for the league minimums) in a single season, joining the 50/40/90 club in 2012-13 with averages of 51.0 percent from the field, 41.6 percent from three-point range and a career-high 90.5 percent from the free throw line. • Named Most Valuable Player of the NBA All-Star Game in 2012, scoring 36 points on 56.0 percent shooting from the field (14-of-25 FG) and grabbing seven rebounds in 37 minutes. • Named NBA Rookie of the Year in 2007-08. • Has recorded eight career regular-season triple-doubles. • Scored 50-plus points four times. • Hit at least one three-pointer in 59 consecutive regular-season games (2/6/15-3/2/16), which ranks fifth-longest in NBA annals behind two Stephen Curry streaks, one by Kyle Korver and one by J.J. Redick. • Ranked as the Thunder’s all-time leader in free throws (4,599) and three-point field goals (1,143) while placing second in scoring (17,566), third in field goals made (5,912), fourth in rebounds (4,518), fourth in blocks (639), fourth in minutes (24,208), sixth in games played (641), seventh in assists (2,363) and eighth in steals (774). • Two-time Olympic gold medalist with Team USA at the 2016 Olympic Games in Rio de Janeiro and 2012 Olympic Games in London... Won gold with Team USA at the 2010 FIBA World Championships in Turkey, earning FIBA World Championships MVP honors. • Named Western Conference Player of the Month 14 times, Western Conference Rookie of the Month five times and Western Conference Player of the Week 25 times. • Among active players, ranks first in scoring average (27.2, fourth all-time), third in free throw percentage (.882, 14th all-time) and sixth in free throws made (4,935, 35th all-time). • On the Warriors’ all-time regular-season career leaders lists, ranks tied for seventh in field goal percentage (.537). • Appeared in 703 career games (all starts) over 10 seasons with Seattle/Oklahoma City and Golden State, averaging 27.2 points, 7.2 rebounds, 3.8 assists, 1.19 steals and 1.05 blocks in 37.4 minutes while shooting 48.8 percent from the field, 37.9 percent from three-point range and 88.2 percent from the free throw line. • Appeared in 106 postseason games (all starts), averaging 28.8 points, 8.0 rebounds, 3.8 assists, 1.19 blocks and 1.05 steals in 41.0 minutes while shooting 46.8 percent from the field, 34.4 percent from three-point range and 85.3 percent from the free throw line. • Has scored 30-plus points 48 times and 40-plus seven times in his postseason career. • Has tallied 33 double-doubles (all point/rebound) in his postseason career, including 17 30/10 games and one 40/10 game. • On the Warriors’ all-time postseason career leaders lists, ranks third in three-point percentage (.442), third in free throw percentage (.893) and fourth in field goal percentage (.556). • On the NBA’s all-time postseason career leaders lists, ranks 14th in three-pointers made (222). • Recorded multiple 40-point games in the 2016 Playoffs, scoring 40 points in Game 5 of the 2016 Western Conference Finals on 5/26/16 at Golden State and a postseason career-high-tying 41 points in Game 4 of the 2016 Western Conference Semifinals on 5/8/16 vs. San Antonio. • Recorded 35 points, 15 rebounds and six assists in Game 1 of the 2013 Western Conference Semifinals on 5/5/13 vs. Memphis, becoming the first player in Thunder franchise history to tally those numbers in a postseason game. • Matched a playoff postseason-high with 41 points in Game 3 of the 2013 First Round on 4/27/13 at Houston... Grabbed 14 rebounds in that contest to tally his first career 40/10 postseason performance. • Scored 17 of his game-high 36 points in the fourth quarter during Game 1 of the 2012 NBA Finals on 6/12/12 vs. Miami... Made his NBA Finals debut in that game. • Scored 18 of his game-high 36 points (including 16-straight Thunder points) in the fourth quarter during a Game 4 win in the 2012 Western Conference Finals on 6/2/12 vs. San Antonio. • Hit the game-winning three-pointer with 14 seconds left in Game 4 of the 2012 Western Conference Semifinals on 5/19/12 at the L.A. Lakers. • Connected on the game-winning field goal with 1.5 seconds left in regulation in Game 1 of the 2012 First Round on 4/28/12 vs. Dallas. • Tied his postseason career-best with 41 points in Game 5 of the 2011 First Round on 4/27/11 vs. Denver, including 16 points in the final frame. • Set a playoff career-high with 41 points (13-of-22 FG) in Game 1 of the 2011 First Round on 4/17/11 vs. Denver. • Corralled a postseason career-high 19 rebounds in Game 3 of the 2010 First Round on 4/22/10 vs. the L.A. Lakers. • Made his NBA playoff debut in Game 1 of the 2010 First Round on 4/18/10 at the L.A. Lakers, scoring 24 points in 42 minutes. • Appeared in 62 games (all starts), averaging 25.1 points, a career-high 8.3 rebounds, 4.9 assists, a career-high 1.60 blocks and 1.06 steals in 33.4 minutes while shooting a career-best 53.7 percent from the field. • Named to the All-NBA Second Team in 2016-17, earning his seventh career All-NBA selection. • Tallied 51 20-point games, 15 30-point games and one 40-point game. • Reached the 20-point threshold in 72 consecutive regular-season games from 11/23/15 to 11/9/16, tying Michael Jordan (12/29/87-12/6/88) for the fourth-longest 20-point streak in NBA history. • Recorded 23 double-doubles, including 16 20-point/10-rebound games, one 20-point/10-assist game and six 30-point/10-rebound games. • Notched one triple-double, his eighth career regular-season triple-double. • Grabbed 10 or more rebounds in 22 games. • Dished out 10 or more assists in two games. • Shot 50 percent or better from the field in 41 games, including shooting 60 percent or better 20 times. • Blocked at least five shots in three games, a single-season career best... Entering 2016-17, had never registered more than one game with five or more blocks in a single season. • Finished the season with 99 blocks, his second-most in a single season (most since a single-season career-best 105 blocks in 2012-13). • Named a starter on the 2017 Western Conference All-Star Team, earning his eighth career All-Star selection... Joined Michael Jordan (1997), LeBron James (2011) and Dwyane Wade (2012) as the only players to tally a triple-double in the All-Star Game, finishing with 21 points, 10 rebounds and 10 assists. • Along with Stephen Curry, named Western Conference Player of the Month for games played in January... Joined Curry, Chris Mullin and Bernard King as the only Warriors ever to receive the monthly recognition (his 14th career Player of the Month award), averaging 27.4 points (fifth in the Western Conference), 7.1 rebounds, 4.6 assists, 2.07 blocks and 1.07 steals in 34.4 minutes over 14 games in January. • Named Western Conference Player of the Week for games played Nov. 21-27. • Recorded 29 points to go with eight rebounds and five assists in 27 minutes on 4/12 vs. the L.A. Lakers. • Finished with his second consecutive double-double (23rd of the season), tallying 16 points and 10 rebounds to go with six assists, one steal and one block in 33 minutes on 4/10 vs. Utah. • Returned to action on 4/8 vs. New Orleans after missing 19 games with a left knee injury, tallying a double-double with 16 points and a game-high 10 rebounds in 31 minutes, recording his 22nd double-double of the season. • Appearing in his 700th career game (700th career start) on 2/28 at Washington, left with a Grade 2 MCL sprain and tibial bone bruise in his left knee after appearing in just 1:33 of action. • Grabbed his 5,000th career rebound on 2/27 at Philadelphia. • Crossed the 19,000-point threshold for his career on 2/15 vs. Sacramento. • Scored 34 points and grabbed nine rebounds in 33 minutes on 2/11 at Oklahoma City... Became the fourth player in NBA history to reach the 100-point threshold in his first three games against his former team, joining John Williamson (vs. Pacers), Adrian Dantley (vs. Lakers) and Allen Iverson (vs. 76ers), per the Elias Sports Bureau. • Recorded his lone 20-point/10-assist game of the season with 26 points and a season-high-tying 10 helpers on 2/2 at the L.A. Clippers. • Scored a season-high 40 points on just 16 field goal attempts on 1/18 vs. Oklahoma City, becoming the first Warrior to score 40 points on 16 shots or fewer in the Shot Clock Era (since 1954-55). • Recorded his 700th career block on 1/8 at Sacramento. • Tallied his first triple-double as a Warrior (eighth career) with 19 points, 11 rebounds and a season-high 10 assists on 12/30 vs. Dallas... Dished out five-straight assists in the third quarter, achieving his triple-double with 4:56 remaining in the third frame to mark the second time in his career that he tallied a triple-double in the first three quarters of play (first: 2/27/13 vs. New Orleans). • Grabbed at least 15 rebounds in consecutive games for the first time in his career (12/25-12/28). • Logged 22 points and a season-high-tying 17 rebounds to go with seven assists and five blocks on 12/28 vs. Toronto, the first time a Warrior has ever tallied at least 20 points, 15 rebounds, five assists and five blocks in a game (since blocks were first recorded in 1973-74). • Recorded 36 points and 15 rebounds on 12/25 at Cleveland, tallying the first Christmas Day double-double of his career and the second-highest scoring output of his career on Christmas (most: 44 vs. Denver, 2010)... Appeared in his seventh Christmas game and has averaged 32.0 points per game on Christmas, which trails only Jerry West (32.2) in points scored per game on the holiday (min. six games)... Shot a perfect 12-of-12 from the free throw line, the most free throws made without a miss in a game on Christmas since Kobe Bryant hit 12-of-12 from the line in 2009. • Notched 28 points to go with 10 rebounds, five assists and a career-high six blocks on 11/26 vs. Minnesota, becoming the first player in Warriors history to tally at least 25 points, 10 rebounds, five assists and five blocks in a game (since blocks were first recorded in 1973-74), per the Elias Sports Bureau. • Hit a season-high 15 free throws (15-of-16 FT) on 10/30 at Phoenix, finishing with 37 points on 10-of-16 (.625) from the field. • Tallied 94 points in his first three games as a Warrior (10/25-10/30), joining Wilt Chamberlain (1959-60) as the only players to ever score at least 90 points in their first three games with the team. • Recorded two-straight 20-point, 10-rebound double-doubles to start his Warriors career (10/25-10/28), joining only Wilt Chamberlain, who did it in his first 56 games with the team in the 1959-60 season. • Tallied his first 30/10 game as a Warrior on 10/28 at New Orleans, scoring 30 points and grabbing a season-high 17 rebounds... Shot a perfect 12-of-12 from the free throw line. • Missed 19 games with a Grade 2 MCL sprain and tibial bone bruise in his left knee (3/2-4/5)... Missed one game (2/25) with a left hand contusion. • Appeared in 15 games (all starts), averaging 28.5 points, 7.9 rebounds and 4.3 assists in 35.5 minutes while shooting playoff career-highs of 55.6 percent from the field, 44.2 percent from three-point range and 89.3 percent from the free throw line. • Scored 20-plus points 11 times and 30-plus nine times. • Recorded six double-doubles (all 25-point/10-rebound games), including four 30/10 games. • Named NBA Finals Most Valuable Player, averaging 35.2 points, 8.2 rebounds, 5.4 assists, 1.60 blocks and 1.00 steal in 39.8 minutes per game for the series… Joined Andre Iguodala (2015) and Rick Barry (1975) as the only Finals MVPs in franchise history... Became the second player in league history to win the Finals MVP Award while averaging at least 35 points, eight rebounds and five assists in The Finals (Michael Jordan in 1993). • Became the fourth player in NBA history to score at least 30 points in every game of The Finals for the winning team (Michael Jordan in 1993, Hakeem Olajuwon in 1995 and Shaquille O’Neal in 2000 and 2002). • Joined Shaquille O’Neal and Michael Jordan as the only players to score at least 25 points in their first 10-straight Finals games. • Scored a 2017 postseason-high 39 points to go with seven rebounds and five assists in Game 5 of the NBA Finals on 6/12 vs. Cleveland, hitting 14-of-20 (.700) from the field and a playoff career-high-tying five three-pointers (5-of-8 3FG). • Scored 35 points, including 15-of-16 (.938) at the free throw line, in Game 4 of the NBA Finals on 6/9 at Cleveland, marking his eighth 30-point game of the postseason... Became the 25th player in NBA history to reach the 3,000-point mark in the postseason. • Finished with 31 points, including seven of the Warriors’ final 11 points of the game, to go with eight rebounds, four assists, one steal and one block in a 2017 postseason-high-tying 41 minutes, in Game 3 of the NBA Finals on 6/7 at Cleveland... Hit the go-ahead three-pointer with 45.3 seconds remaining in the game. • Tallied 33 points, a 2017 postseason-high-tying 13 rebounds, six assists, a playoff career-high-tying five blocks and three steals in Game 2 of the NBA Finals on 6/4 vs. Cleveland, becoming the first player ever to tally those figures in any postseason game (since blocks and steals were first recorded in 1973-74, per the Elias Sports Bureau). • Scored 38 points to go with eight rebounds, a 2017 postseason-high eight assists and no turnovers in Game 1 of the NBA Finals on 6/1 vs. Cleveland... Became the first player to score at least 38 points in a Finals game without committing a turnover since Shaquille O’Neal tallied 41 points with no miscues on 6/19/00... Scored 23 points in the first half, a 2017 postseason-high for scoring in any half. • In the Western Conference Finals against San Antonio, averaged 28.0 points per game on 60.3 percent from the field (38-of-63 FG). • Recorded his fifth 25-point/10-rebound game of the 2017 postseason in Game 4 of the Western Conference Finals on 5/22 at San Antonio, finishing with 29 points (10-of-13 FG) and 12 rebounds in 38 minutes. • Appeared in his 100th career postseason game in Game 3 of the Western Conference Finals on 5/20 at San Antonio, tallying 33 points, his fourth 30-point game of the postseason, including a playoff quarter career-high 19 points in the third frame... Added 10 rebounds to tally his third 30-point/10-rebound game of the 2017 postseason (16th career)... Hit 3-of-5 (.600) from three-point range to become the 17th player in NBA history to connect on at least 200 career postseason threes. • Recorded his third 30-point game of the postseason in Game 1 of the Western Conference Finals on 5/14 vs. San Antonio, finishing with 34 points (20 in the second half)... Tallied five rebounds, four assists and four blocks in 39 minutes. 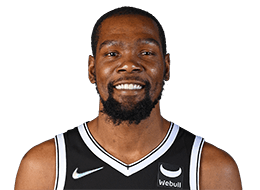 • Tallied 38 points (22 in the first half), a 2017 postseason-high 13 rebounds and 39 minutes in Game 3 of the Western Conference Semifinals on 5/6 at Utah, recording his second 30/10 game of the postseason (15th career)... Became the first Warrior with at least 25 points and 10 rebounds in back-to-back playoff games since Nate Thurmond in 1972. • Recorded his second 20/10 game of the 2017 postseason with 25 points, 11 rebounds and seven assists in 36 minutes in Game 2 of the Western Conference Semifinals on 5/4 vs. Utah, hitting 13-of-15 (.867) from the free throw line. • Returned from a two-game absence in Game 4 of the First Round on 4/24 at Portland, scoring 10 points in 20 minutes. • In his Warriors playoff debut in Game 1 of the First Round on 4/16 vs. Portland, scored 32 points and grabbed 11 rebounds, tallying his 14th career postseason 30/10 game. • Missed Games 2 and 3 of the First Round against Portland with a left calf strain (4/19-4/22). • Appeared in 72 games (all starts), averaging 28.2 points, a career-best 8.2 rebounds, 5.0 assists and a career-high 1.18 blocks in 35.8 minutes. • Became the first player since Michael Jordan in 1988-89 to average over 28 points, eight rebounds and five assists in a season. • Named to the All-NBA Second Team. • Earned Western Conference Player of the Week honors five times and Western Conference Player of the Month accolades twice (December and January). • Scored 20-plus points in 71 games, including each of his last 64 regular season games (highest current streak in the NBA), dating back to 11/23, a career-high streak and the longest stretch in the NBA since Jordan in 1990-1991 (69 games)…Joined Jordan and Wilt Chamberlain as the only players in NBA history to string together 50-plus straight games in one season of at least 20 points on multiple occasions. • Scored 30-plus points 29 times and 40-plus three times. • Tallied 27 double-doubles and one triple-double. • Finished season with a Player Efficiency Rating of 28.3 (second in the NBA to only Stephen Curry, 31.5). • Totaled at least 25 points, 10 rebounds and five assists in seven consecutive games (2/25-3/9), one of only two players since the NBA/ABA merger (Larry Bird) to reach a streak of seven or more games... In that same time span, produced a double-double in a career-best seven games. • Started the NBA All-Star Game for the fifth time, earning his seventh All-Star appearance. • Named Western Conference Player of the Month for January after finishing second in the NBA in scoring (28.5 points) and adding 9.3 rebounds and 4.3 assists... Shot 49.7 percent from the field and 88.8 percent from the free throw line. • Named Western Conference Player of the Month for December alongside Russell Westbrook after averaging 24.9 points, 7.2 rebounds and 5.7 assists while shooting 50.8 percent from the field... Reached the 20-point mark in all 15 December games. • Scored a season-high 44 points on 1/26 at New York. • Tallied 25 points, 12 rebounds and 10 assists in his first triple-double of the season on 12/10 vs. Atlanta. • Scored 43 points on 15-of-30 (.500) shooting from the field on 10/30 at Orlando. • Appeared in 18 postseason games (all starts), averaging 28.4 points, 7.1 rebounds, 1.00 steals and 1.00 blocks in 40.3 minutes. • Recorded multiple 40-point games in the 2016 Playoffs, scoring 40 points in 45 minutes on 5/26 at Golden State in Game 5 of the Western Conference Finals and scoring a postseason career-high-tying 41 points on 5/8 vs. San Antonio in Game 4 of the Western Conference Semifinals. • Scored 30-plus six times and 40-plus twice... Recorded two double-doubles (both in the Western Conference Finals). • Appeared in 27 games (all starts), averaging 25.4 points, 6.6 rebounds and 4.1 assists in 33.8 minutes. • Scored 20-plus 20 times, 30-plus eight times and 40-plus twice. • Named to the Western Conference All-Star team for the sixth consecutive season. • Earned Western Conference Player of the Week honors once. • Hit a career-high-tying seven three point field goals on 2/9 at Denver. • Scored a season-high 44 points to go with 10 rebounds and seven assists on 12/31 in a win over Phoenix. • Returned to the Thunder lineup on 12/2 vs. New Orleans after missing the first 17 games of the year to a right foot Jones fracture... Scored 27 points with three rebounds and two assists in 30 minutes in his return. • Scored a career-high 30 first-half points on 10-of-13 shooting (5-of-6 from three) in 19 minutes on 12/18 at Golden State, becoming the first player since the NBA-ABA merger to score 30-plus points in fewer than 20 minutes played. • Missed 28 games following right foot surgery, 17 games with a right foot Jones fracture, six games with a right ankle sprain, four games with a sprained left toe. • Named the 2013-14 Kia NBA Most Valuable Player after averaging career-highs with 32.0 points and 5.5 assists to go with 7.4 rebounds and 1.27 steals in 38.5 minutes. • Led the NBA in scoring (32.0) for the fourth time in his career. • Named to the All-NBA First Team for a fifth consecutive season. • Earned Western Conference Player of the Week honors six times and Western Conference Player of the Month accolades four times (November, December, January and March). • Scored 30-plus an NBA-high 47 times, 40-plus an NBA-high 14 times and 50-plus twice. • Tallied 27 double-doubles, including 17 30-point/10-rebound games, and three triple-doubles. • Scored 25 points in 41 straight games from 1/7-4/8 (longest streak of his career and third longest in NBA history). • During the month of January, averaged 35.9 points per game while shooting 54.9 percent from the field (highest scoring month of his career). • Scored 30-plus points in 12 consecutive games during the month of January (longest streak of his career). • Set a career-high with 54 points on 1/17 vs. Golden State, representing an Oklahoma City-era record for most points scored in a game. • Scored 51 points, marking the fourth 50-point game of his career, during a double-overtime win on 3/31 at Toronto. • Registered 32 points, 10 rebounds, 12 assists, four steals and four blocks on 12/1 against Minnesota to become the first player to hit such benchmarks since blocks and steals became official stats during the 1973-74 season. • Scored 42 points in the Thunder season opener on 10/30 at Utah, the second-most points scored in franchise history on opening night (Dale Ellis scored 46 points in 1988). • Named a starter on the Western Conference All-Star team for the fourth consecutive season (fifth overall All-Star appearance)... Finished with a game-high tying 38 points, 10 rebounds and six assists in 35 minutes. • Appeared in 19 postseason games (all starts), averaging 29.6 points, 8.9 rebounds, 3.9 assists and 1.32 blocks in 42.9 minutes. • Recorded seven playoff double-doubles and 11 30-plus point performances. • Appeared in 81 games (all starts), averaging 28.1 points, 7.9 rebounds, 4.6 assists, 1.43 steals and 1.30 blocks in 38.5 minutes. • Became the sixth player in NBA history to finish the season shooting 50 percent from the field, 40 percent from three-point range and 90 percent from the free throw line (while qualifying for the league minimums), joining the 50/40/90 club with averages of 51.0 percent from the field, 41.6 percent from three-point range and a career-high 90.5 percent from the free throw line. • Named to the All-NBA First Team for a fourth consecutive season. • Led the NBA in free throw shooting (.905) and total points scored (2,280). • Named Western Conference Player of the Week four times and Western Conference Player of the Month twice (October/November and March). • Tallied 20-plus points 71 times, 30-plus 33 times and 40-plus six times. • Notched 18 double-doubles and three triple-doubles (2/27 vs. New Orleans; 2/20 at Houston; and his first career triple-double on 11/18 vs. Golden State). • Set a career-high with 11 assists on 2/20 at Houston. • Named a starter on the 2013 Western Conference All-Star Team (third time being named a starter and fourth All-Star selection overall)... Recorded a game-high 30 points (13-of-24 FG) in the All-Star Game to help lead the West All-Stars to victory. • Registered a then-career-high 52 points on 1/18 at Dallas, hitting a perfect 21-of-21 from the free throw line, which ranked as the second-best free throw shooting game in NBA history behind Dominique Wilkins in 1992, who went 23-of-23 from the free throw line. • Became the first player in NBA history to record 20-plus made free throws in back-to-back games (1/18-1/20). • Started the season with three consecutive double-doubles for the first time in his career. • Posted double-doubles in the first half of three games (11/2 vs. Portland; 11/18 vs. Golden State; 2/24 vs. Chicago) after only accomplishing the feat once previously. • Appeared in 11 postseason games (all starts), averaging an NBA-best 30.8 points, 6.3 assists and 9.0 rebounds in 44.0 minutes. • Recorded three double doubles in the postseason. • Scored 20-plus points in all 11 postseason games, including five 30 point efforts and one 40 point outing. • Recorded 35 points, 15 rebounds and six assists in Game 1 of the Western Conference Semifinals on 5/5 vs. Memphis, becoming the first player in franchise history to tally those numbers in a postseason game. • Matched a playoff postseason-high with 41 points in Game 3 of the First Round on 4/27 at Houston. • Appeared in all 66 games (all starts), averaging an NBA-best 28.0 points to go with 8.0 rebounds, 3.5 assists, 1.33 steals and 1.17 blocks in 38.6 minutes. • Became the seventh player in league history to lead the NBA in scoring for three consecutive seasons. • Named to the All-NBA First Team for a third consecutive season. • Named Western Conference Player of the Week three times and Western Conference Player of the Month twice (February and March). • Scored 30-plus 25 times, 40-plus four times and 50-plus once. • Pulled-down a season-high 17 rebounds on 3/23 vs. Minnesota. • Scored a then-career-high 51 points during overtime win on 2/19 vs. Denver. • Named MVP of the All-Star Game after posting a game-high 36 points on 56.0 percent shooting from the field (14-of-25 FG) and grabbing seven rebounds. • Named a starter on the 2012 Western Conference All-Star team after receiving 1,345,566 votes, second-most in the Western Conference. • Connected on the third game-winning field goal of his career as time expired on 12/29 vs. Dallas. • Became the first player to score 30-plus points in the first four games of the season since Kobe Bryant (2005-06 season). • Appeared in 20 postseason games (all starts), averaging 28.5 points, 7.4 rebounds, 3.7 assists and 1.20 blocks in 41.9 minutes. • Scored 20-plus in all 20 playoff games, including 30-plus 10 times. • Recorded seven postseason double-doubles. • Scored 17 of his game-high 36 points in the fourth quarter during Game 1 of the NBA Finals on 6/12 vs. Miami. • Scored 18 of his game-high 36 points (including 16-straight Thunder points) in the fourth quarter during a Game 4 win in the Western Conference Finals on 6/2 vs. San Antonio. • Hit the game-winning three-pointer with 14 seconds left on 5/19 at the L.A. Lakers in Game 4 of the Western Conference Semifinals. • Connected on the game-winning field goal with 1.5 seconds left in regulation on 4/28 vs. Dallas in Game 1 of the First Round. 2010-11 HIGHLIGHTS WITH OKLAHOMA CITY: • Appeared in 78 games (all starts), averaging an NBA-best 27.7 points to go with 6.8 rebounds, 2.7 assists and 1.13 steals in 38.9 minutes. • Became just the 11th player in NBA history to win the scoring title in back-to-back seasons. • Named to the All-NBA First Team for a second consecutive season. • Scored 30-plus an NBA-best 29 times and 40-plus an NBA-best five times. • Named Western Conference Player of the Week twice and Western Conference Player of the Month twice (December and April). • Finished his fourth professional season with 8,128 career points, second-most all-time through his first four seasons behind only LeBron James (8,439 points). • Recorded five straight double-doubles for the first time in his career (1/30-2/8). • Tied a career-high with five blocks on 3/27 at Portland. • Appeared in his 300th career NBA game 3/18 vs. Charlotte. • Scored 34 points in his second All-Star appearance on 2/20 in Los Angeles. • Matched a then-career-high with 47 points and set a career-high with 18 rebounds on 1/26 at Minnesota. • Made the game-winning three-point field goal as time expired on 1/22 vs. New York. • Appeared in 17 postseason games (all starts), averaging 28.6 points, 8.2 rebounds, 2.8 assists and 1.12 blocks in 42.5 minutes. • Scored 30-plus seven times and 40-plus three times. • Became the 20th player in NBA history to score at least 39 points in a Game 7 during Oklahoma City’s Western Conference Semifinals victory on 5/15 over Memphis, scoring 39 points on 13-of-25 (.520) shooting from the field. • Matched his postseason career-best postseason scoring effort with 41 points on 4/27 vs. Denver in Game 5 of the First Round, including 16 points in the final frame. • Made a playoff career-high five three-point field goals on 4/25 vs. Denver in Game 4 of the First Round. • Set a playoff career-high with 41 points (13-of-22 FG) on 4/17 vs. Denver in Game 1 of the First Round. • Appeared in 82 games (all starts), averaging an NBA-best 30.1 points, 7.6 rebounds, 2.8 assists, 1.37 steals and 1.02 blocks in 39.5 minutes. • At 21 years old, became the youngest player in NBA history to win the scoring title. • Named First Team All-NBA. • Finished second behind LeBron James in NBA Most Valuable Player voting. • Became one of only 10 players in NBA history to start every game and average 30-plus points. • Set franchise record and led the NBA with 756 made free throws. • Earned Player of the Week honors three times and Player of the Month honors once (April). • Scored 30-plus points an NBA-best 47 times and 40-plus eight times. • Set the all-time franchise record for points in a single season (2,472 points scored). • Matched his season-high with 45 points and set a career-high with seven made three-pointers on 4/6 at Utah. • Recorded back-to-back 40-point games for the first time in his career on 4/6 at Utah and 4/4 vs. Minnesota. • Made his first career All-Star appearance, recording 15 points and five rebounds in 20 minutes. • Became the second youngest NBA player behind only LeBron James to record 2,000 points through his first 68 games at age 21 or younger. • Scored a season-high 45 points to go with 11 rebounds on 1/31 vs. Golden State... Connected on 16-of-21 (.762) from the field in that contest, becoming the second player in franchise history to score 45-plus points on better than 75 percent shooting (Spencer Haywood on 1/7/72; 48 points on 21-of-28 FG). • Became the second-youngest NBA player behind only LeBron James to reach 4,000 career points, doing so on 12/4 vs. Boston, finishing that game with 36 points. • With his 28-point performance on 11-of-22 (.500) shooting on 11/24 against Utah, became just the fourth player in league history to score at least 400 points during the first 15 games of a season at age 21 or younger, joining LeBron James (twice), Shaquille O’Neal and Michael Jordan. • Set all-time franchise record for most free throws without a miss (18) on 11/10 at Sacramento en route to game-high 37 points. • Appeared in six postseason games (all starts), averaging 25.0 points, 7.7 rebounds, 2.3 assists and 1.33 blocks in 38.5 minutes. • Appeared in 74 games (all starts), averaging 25. 3 points, 6. 5 rebounds, 2. 8 assists and 1. 30 steals in 39. 0 minutes. • Ranked sixth in the NBA in scoring and fifth in minutes. • Scored 20-plus 57 times, 30-plus 21 times and 40-plus three times. • Scored a then-career-high 47 points on 2/17 vs. New Orleans. • Set a franchise record with 24 free throws (24-26 FT) and a then-career-high 15 rebounds on 1/23 at the L. A. Clippers. • Swiped a career-high five steals on 12/13 at Dallas. • Appeared in 80 games (all starts), averaging 20.3 points (first among rookies, 24th in NBA), 4.4 rebounds and 2.4 assists in 34.6 minutes. • Named NBA Rookie of the Year. • Earned NBA All-Rookie First-Team honors. • Named Western Conference Rookie of the Month five times. • Became the third teenager to average more than 20 points per game (Carmelo Anthony, LeBron James). • Shot 87.3 percent from the free throw line, which ranked first among rookies and 11th in the NBA. • Scored 20-plus points 44 times and 30-plus seven times. • Led the team with 75 blocks. • Played in the T-Mobile Rookie Challenge at NBA All-Star Weekend in New Orleans, tallying 23 points, eight rebounds and four assists. • Recorded a then-career-high 42 points on 18-of-25 (.720) shooting from the field on 4/16 at Golden State, adding a then-career-high 13 rebounds... At age 19 years and 200 days, no player in the history of the NBA had scored as many points in a game at a younger age. • Won his second Olympic gold medal with Team USA at the 2016 Olympics in Rio de Janeiro, averaging a team-high 19.4 points per game during the team’s perfect 8-0 run through the tournament... Averaged 5.0 rebounds and 3.5 assists in 28.6 minutes of Olympic play in Rio, shooting 57.8 percent from the field and 58.1 percent from three-point range. • Scored a game-high 30 points and dished out four assists in Team USA’s gold medal winning victory over Serbia in 2016. • Won his first career Olympic gold medal with Team USA at the 2012 Olympics in London, averaging 19.5 points and 5.8 rebounds in 26.0 minutes per game. • In the U.S. men’s career Olympic record book, ranks first in three-point field goals made (59), second in points (311) behind Carmelo Anthony (336) and third in field goals made (101). • Owns the two highest point totals in a single Olympic competition in Team USA history, scoring a record 156 points in 2012 and 155 points in 2016. • During the summer of 2010, helped lead the U.S. Men’s National Team to a gold medal during the 2010 FIBA World Championships in Turkey... Named the 2010 FIBA World Championships Most Valuable Player. • Recorded a game-high 28 points during the United States’ gold medal winning victory over host country Turkey in 2010. • Set the all-time USA single game scoring record by notching 38 points during Team USA’s semifinal match-up versus Lithuania in 2010. • Appeared in 35 games in his lone season at Texas, averaging 25.8 points (first in the Big 12, fourth in the nation), 11.1 rebounds, 1.91 blocks and 1.89 steals in 35.9 minutes. • Earned National Player of the Year honors from The Associated Press, NABC, USBWA, CBS/Chevrolet and The Sporting News. • Named the winner of the Adolph Rupp Trophy, the Naismith Award and the Wooden Award, becoming the first-ever freshman in NCAA history to win any of those awards. • Earned consensus First Team All-American honors, becoming just the third freshman in NCAA history to earn that honor, joining Wayman Tisdale (1983) and Chris Jackson (1989). • Named Big 12 Freshman and Player of the Year, earned First Team All-Conference honors and was named to the league’s All-Defensive Team. • Set single-season school and Big 12 record for points in a season with 903, a total that ranked as the second-most by a freshman in NCAA history. • Set a single-season school record for total rebounds with 390, a mark that ranked second in Big 12 history and third all-time for a freshman in NCAA history. • Scored 20-plus points 30 times and 30-plus 11 times. • Named Big 12 Tournament Most Valuable Player after scoring a tournament-record 92 points. • HIGH SCHOOL HIGHLIGHTS: • Named First Team All-American by USA Today and Parade Magazine after senior season at Montrose Christian (MD) in 2005-06 after averaging 23.6 points, 10.2 rebounds, 3.0 assists, 3.0 steals and 2.6 blocks. • Named Co-MVP of the McDonald’s All-American Game after posting 25 points for the West squad. • Led Montrose Christian to a 20-2 record and a No. 9 ranking in the final USA Today poll. • Named Second Team All-American by Parade Magazine as a junior in 2004-05. • Averaged 19.6 points and 8.8 rebounds for Oak Hill Academy as a junior... Shot 65 percent from the field, including 43 percent from three-point range.